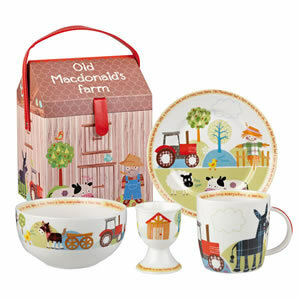 Make mealtimes extra fun with our adorable range of Children’s Breakfast and Dinner Sets. Made from a variety of materials, our Melamine, Ceramic, Porcelain and even Biodegradable Bamboo sets are perfect for brightening up your children’s mealtimes. Perfect for small children with big appetites. 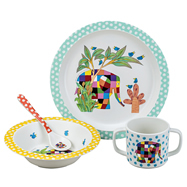 Both girls and boys will love the fun designs of our baby melamine dinner sets and children's ceramic tableware. Why not personalise your child’s dinner set for an extra added touch with our Personalised Ceramic Sets. Our 3 piece sets include a plate, bowl and mug including adorable designs with plenty of room for personalisation. 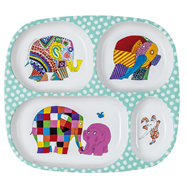 Take a peek at our baby melamine range which are great for kids as they are durable, light-weight and easy to clean. Including fun and creative themes, choose from a Pirate, Cupcake Fairy, Space and Jungle theme. Or choose from our timeless favourites, Peter Rabbit, Elmer the Elephant and Paddington. Make mealtimes informative as well as fun with our educational placemats. Including creative mind puzzles and tongue twisters, our colourful and easy wipe clean placemats are perfect for spillages and keeping your little ones entertained at the dinner table. Our children’s range of tableware includes cutlery, Ceramic and Melamine Dinner Sets, Compartment Trays, Placemats, Personalised Tableware and many more! Designed with stunning and colourful patterns and illustrations to keep your little one engaged. Every set is made with kids in mind and many include easy grip sippy cups, BPA and phthalate free materials and easy grip handles - perfect for tiny hands! Perfect as christening gifts or as a special birthday present our Children's Porcelain and Ceramic Breakfast Sets come gift boxed in a variety of designs that will enchant little ones and can be cherished as keepsakes for years to come.